This is a good way to start your journey of mastering the art of tempering chocolate. Weigh out the total amount of chocolate you need for the recipe, then remove one third of it and set aside. Melt the remaining two thirds of chocolate for 30-second bursts in the microwave on a low heat to 45°C. Then stir through the third you have reserved. Because the unmelted chocolate is already tempered, by adding it to the melted chocolate you are stirring in the crystallized cocoa butter that you need to complete the tempering process. Check the temperature of the chocolate. For dark chocolate, it should now be 32°C and will be perfectly tempered. Milk chocolate should be 29°C and white should be 30°C. 1. Mix the sugar and the peppermint extract together and set aside to infuse. Temper the chocolate, following the instructions above. 2. Stir the peppermint-infused sugar through the tempered chocolate. 3. Divide the chocolate mixture between the prepared baking sheets. Sprinkle each with half of the white chocolate stars. Set aside at room temperature to cool completely then chill in the fridge for 30 minutes. 4. 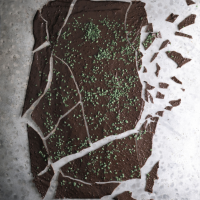 Create the ‘snap’ by lifting the set chocolate layers from the baking sheets and dropping from a height onto a clean work surface.